Right Crank Case Eagle Group T2448SE-BS-HA 14 Gauge Type 304 Stainless Steel Adjustable Height ADA / Ergonomic Work Table with Backsplash and Undershelf - 24" x 48"
Will using casters on my Eagle Group work table or equipment stand increase the working height? As an added service, Eagle Group will automatically send shorter table legs when you purchase one of their work tables or stands along with a set of Eagle Group casters. The shorter legs will guarantee that your table’s height will remain the same as is listed on the table’s product page, ensuring a comfortable working height for your needs. Prepare food and perform a variety of other essential kitchen tasks with the Eagle Group T2448SE-BS-HA stainless steel adjustable height ADA / ergonomic work table with an undershelf! The adjustable design allows the top to be raised and lowered between 32" and 40" high. With 8" of adjustability, this work table provides unlimited work height options. Plus, the crank case has an easy folding handle to keep it out of the way when it's not in use. This work table features an all stainless steel construction for long-lasting durability. With the 14 gauge, type 304 stainless steel top and a 4" backsplash, a heavy gauge stainless steel undershelf, and sturdy 1 5/8" diameter stainless steel legs, this table is great for all of your heavy-duty work table needs. The legs have 1" adjustable stainless steel bullet feet that help level the table on uneven floors, and a patented uni-lok gusset system for additional structural support. Its adjustable undershelf has a marine edge to prevent product from spilling or sliding off. Plus, it provides extra versatility and storage space in your kitchen for light equipment, supplies, and other frequently used items. 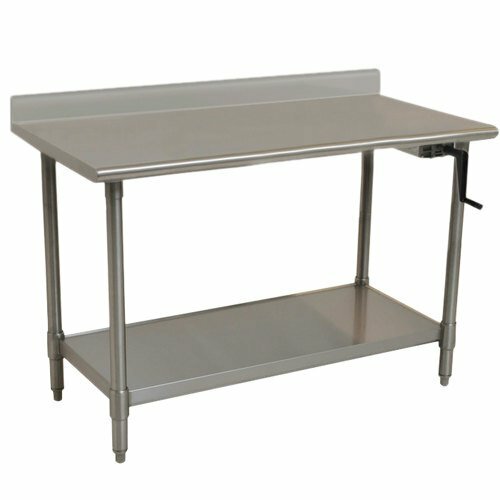 Work Surface Height: 28" - 36"
Eagle Group T2448SE-BS-HA 14 Gauge Type 304 Stainless Steel Adjustable Height ADA / Ergonomic Work Table with Backsplash and Undershelf - 24" x 48"